Francis James Taylor, known as Frank, was born in New Headington in 1899 and baptised at St Andrew's Church on 24 September. He was the son of Thomas Arnold Soanes Taylor, who was born at Paradise Square, Oxford and baptised at St Ebbe's Church on 31 May 1868. By the time of the 1881 census Frank’s father Thomas Taylor had moved up with his parents from St Ebbe's to New Headington village, and at the age of 13 he was already employed as a general labourer, while his father was unemployed and his mother was a laundress. Frank's mother Mary Jane Neville or Nevill was born in New Headington in 1870 and baptised at St Andrew’s Church on 4 December. At the time of the 1881 census she was aged 10 and living in New Headington with her parents and four siblings, and her father was a gardener. Violet Ruby Taylor (born at 21 Windsor Street, New Headington on 21 September 1909 and baptised at St Andrew’s Church on 7 November). At the time of the 1901 census Frank (1) was living at New High Street (probably No. 31) with his father Thomas (33), who was a self-employed house painter, his mother Mary (30), and his siblings Hilda (6), Thomas (5), and Winnie (3). In July 1908 Frank’s father bought the shop at 21 Windsor Street for £180. For some reason he sold it the next year Mrs Sarah Jane Carter, although he remained there as a tenant until about 1910, and Frank’s sister Violet was born there. By the time of the 1911 census Frank (11) was living at 28 New High Street with his father Thomas (43), who described himself as a home decorator and employer, his mother Mary (40) and his six siblings: Hilda (16), who was working as a day girl; Thomas (15), who was assisting in his father's business; Winnie (13), who was a mother's help; and Eva (8), Edward (4), and Violet (1). Within a year, probably as Frank’s father’s painting and decorating business grew, the family moved to the present 4 Lime Walk (then numbered 10) in All Saints’ parish. In the First World War Francis James Taylor served as a Private in the Duke of Cambridge's Own (Middlesex) Regiment (Service No. G/44638). 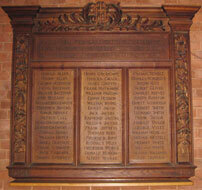 He was then posted to the 1st Hampshire Regiment (Service No. 44638) and was attached to the 19th Battalion of the London Regiment . He died of pneumonia in France at the age of 18 on 6 December 1918. After the Armistice the 39th Stationary Hospital was at Lille, and he may have also been wounded. Mrs Mary Jane Taylor died at the age of 61 at the present 4 Lime Walk and was buried at Headington Cemetery on 24 February 1932. Thomas Arnold Soanes Taylor was still living at the present 4 Lime Walk in 1947, when Kelly’s also lists “Thomas A. Taylor & Son painters” at the house. He died at the Cowley Road Hospital on 24 June 1950. His effects came to £3,775 15s. 5d., and the retired works manager Stanley Dearlove was his executor. Hilda Mary Taylor (born 1894) gave birth to Jack Taylor at Lime Walk around 1 October 1913 and had him baptised at All Saints’ Church on 11 October 1913 when he was already dead or dying, as he was marked as dead in the baptismal register: he was buried at Headington Cemetery three days later. She married Jack Marsh in the Headington registration district in the third quarter of 1921. Thomas Arnold Neville Taylor (born 1895) married Lilian R. Hawes in the Oxford registration district in the first quarter of 1921. Winnifred Edna Taylor (born 1897) married Aubrey R. Taylor in the Headington registration district in the second quarter of 1928. Violet Ruby Taylor (born 1909) married Cyril Brown in the Oxford registration district in the fourth quarter of 1933. Eveline Dorothy Taylor (born 1901) married Henry W. Hansford in the Headington registration district in the third quarter of 1925.